When in the Course of urban events, it becomes necessary for a people to overthrow the tired paradigm which has guided city building for too long, and to assume a new model of urban growth and renewal for our cities on this earth, the distinct and equal status to which the Laws of Common Sense and of Common Sense’s Spirit entitles them, a decent respect to the opinions of mankind requires that they should declare the causes which impel them to revolution. 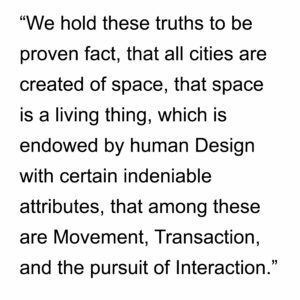 We hold these truths to be proven fact, that all cities are created of space, that space is a living thing, which is endowed by human Design with certain indeniable attributes, that among these are Movement, Transaction, and the pursuit of Interaction. 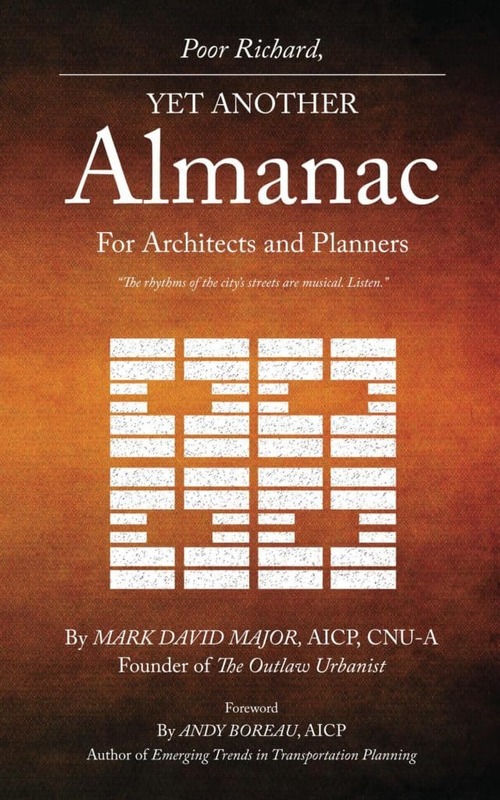 That to secure these attributes, Urban Designers and Planners are instituted among Men, deriving their just powers from the Beingness of the City, that whenever any paradigm becomes destructive of these ends, it is the Right of the People to alter or abolish it, and to institute a new Paradigm, laying its foundation on such common sense and organizing its principles in such form, as to them shall to most likely perpetuate the vitality and sustainability of the City. Scientific method, indeed, will dictate that a Paradigm long established should not be changed for light and transient causes; and accordingly all experience has shown, that mankind are more disposed to suffer, while Its evils are sufferable, than to right themselves by overthrowing a Paradigm to which they are accustomed. But when a long train of abuses and corruptions, pursuing invariably the same Object manifests a Design to reduce them under absolute Lunacy, it is their right, it is their duty, to throw off such Paradigm, and to provide a new model for the future of the city. It has refused to Assent to the wisdom of good Design, the most wholesome and necessary for the public good, found common over 10,000 years of city building. 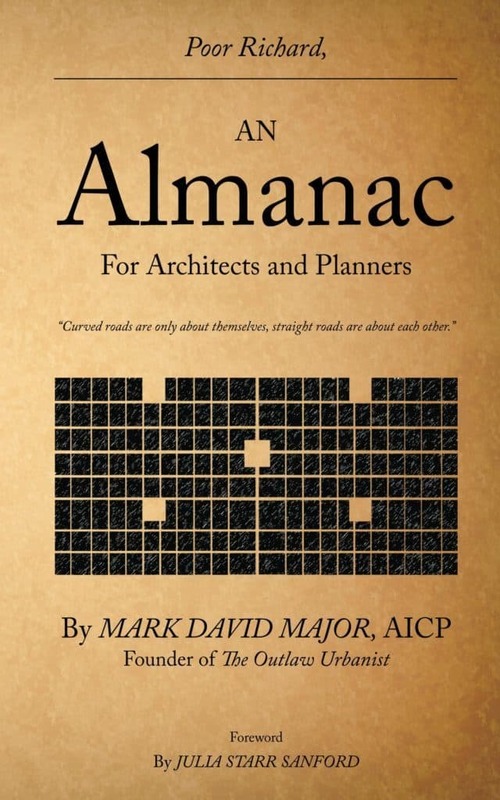 It has passed Laws and Regulations contrary to the common wisdom of good Design over 10,000 years of city building, refused to reform or suspend such Laws and Regulations when proven fallacious, or lest utterly neglected to attend to them for the public good. 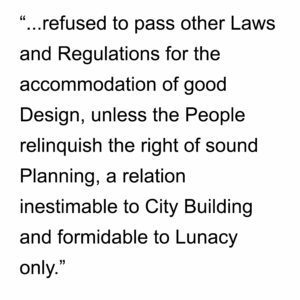 It has refused to pass other Laws and Regulations for the accommodation of good Design, unless the People relinquish the right of sound Planning, a relation inestimable to City Building and formidable to Lunacy only. It has conspired to call together Professionals at places unusual, uncomfortable, and distant from Public view, for the sole purposes of corrupting and fatiguing the City into compliance with Its measures. It has dissolved Common Sense repeatedly, for opposing with manly firmness Its invasions on the vital humanism of the City. It has conspired for a long time, after such dissolutions, to promote mediocre Professionals; whereby the Paradigm, incapable of Annihilation, have been applied to Cities at large without recourse nor correction; the City remaining in the mean time exposed to all the dangers from without, and convulsions within. 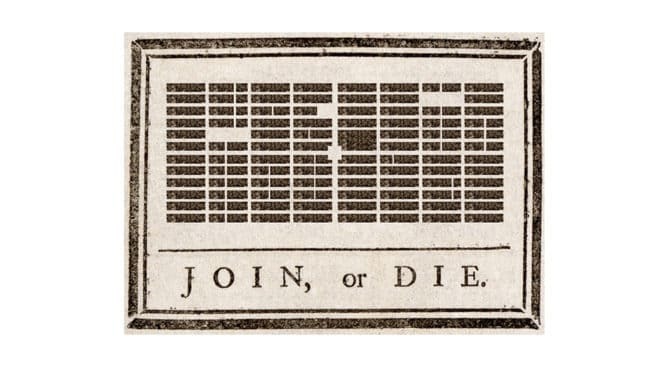 It has endeavored to prevent the good Design of these cities; for that purpose of obstructing the Common Sense building of the City; refusing to pass Laws and Regulations to encourage good Design, and raising the conditions for the Misappropriation of Lands and Social Isolation of Populations. It has obstructed the Administration of Space for pedestrians, by promoting its Assent to Laws for accommodating the Automobile. It has made the People dependent on the Automobile alone, for the movement, transaction and interaction of their everyday activities, and increased the time and cost of their livelihood in Urban conditions. It has erected a multitude of New Laws and Regulations, and sent hither swarms of Attorneys to harass our people, and eat out their substance. It has kept among us Allocations for Parking designed solely for a handful days of Christmas shopping without regard for times or amount of use in the rest of the Year. It has affected to render the desires of Professionals independent of and superior to the Civic good. 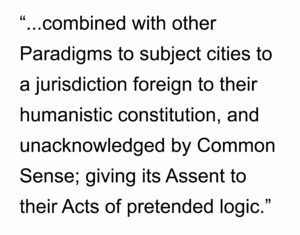 It has combined with other Paradigms to subject cities to a jurisdiction foreign to their humanistic constitution, and unacknowledged by Common Sense; giving its Assent to their Acts of pretended logic. 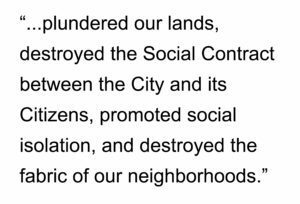 It has plundered our lands, destroyed the Social Contract between the City and its Citizens, promoted social isolation, and destroyed the fabric of our neighborhoods. It is at this time renewing efforts to sprawl large suburban communities of suspect Value to complete the works of isolation, desolation and lunacy, already begun with circumstances of Euclidean zoning and deceits of transportation engineering and planning scarcely paralleled in the most barbarous ages, and totally unworthy as a model of City Building lest the Death of the City is its aim. It has constrained our fellow Citizens taken Captive in a web of bureaucratic incompetence in all agencies against their Cities, to become the executioners of Urban Vitality and Sustainability, or to fail by their Hands. 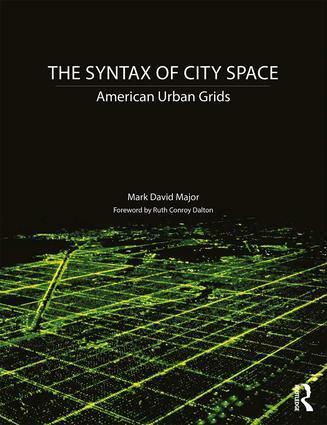 It has excited domestic special interests against the City, and has endeavored to bring on the Death of our Cities at the hands of faceless suburban sprawl, whose known rule of assimilation is an undistinguished conformity of all ages, sexes and conditions. Our repeated Petitions have been answered only by repeated injury. A Paradigm whose character is thus marked by every act which may define Lunacy, is unfit to be a model for Great Cities. Nor have Urban Designers and Planners been wanting in attentions to our plight. They have been warned from time to time of attempts by their Paradigm to extend its unwarrantable reign over our Cities. Urban Designers and Planners have been reminded of the flaws of their Paradigm, and they have been conjured by the ties of our common kindred to disavow these corruptions, which, would inevitably spurn revolution. Urban Designers and Planners too have been deaf to the voice of Common Sense and Accepted Wisdom. 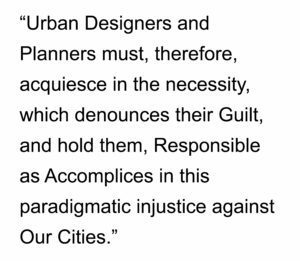 Urban Designers and Planners must, therefore, acquiesce in the necessity, which denounces their Guilt, and hold them, Responsible as Accomplices in this paradigmatic injustice against Our Cities. We, therefore, The Outlaw Urbanist, in General Congress, Assembled, appealing to the our Ancestral history and the wisdom of Master Builders for the righteousness of our cause, do, in the Name, and by Authority of the good People of our Cities, solemnly publish and declare, that Our Cities are, and of Right ought to be Free of the Prevailing Paradigm; that we are Absolved from All Allegiance to the Prevailing Paradigm; and that all political and moral connection between It and City Building is and ought to be totally overthrown; and that as Free and Independent Thinkers, we have full Power to build traditional cities, foster movement, transaction and social interaction in Cities made of Space, and to do all other Acts and Things which Independent Thinkers may of right do. And for the support of this Declaration, with firm reliance on the protection of Common Sense in the Human Spirit, we pledge each other our Lives, our Fortunes and our sacred Honor. This article appears in Major, M.D. 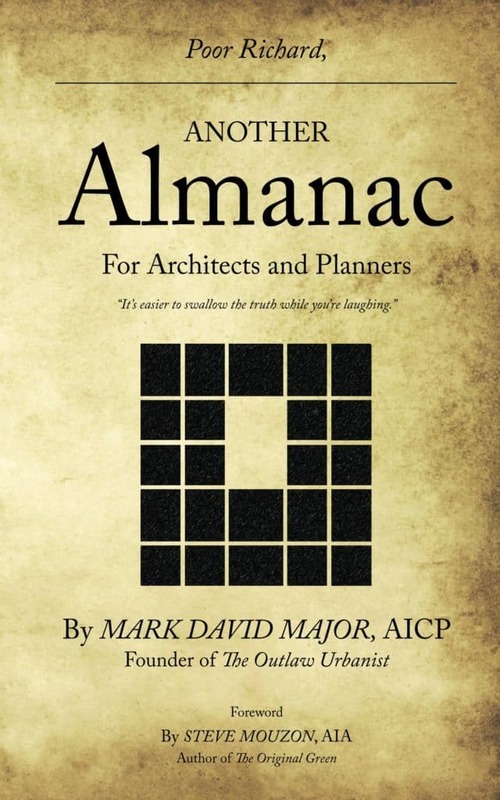 (2012) Poor Richard, An Almanac for Architects and Planners (Volume 1 with Foreword by Julia Starr Sanford). Jacksonville, Florida: Forum Books, ISBN-10: 1482659379, ISBN-13: 978-1482659375, ASIN: B00Q1V5VLK. Available for purchase on this page. A study published this month in the American Journal of Preventive Medicine found that the longer people drive to work, the more likely they are to have poor cardiovascular health. The study monitored the health of 4,297 adults from 12 counties in Texas, a metropolitan region where 90 percent of people commute to work by car, Hoehner said. 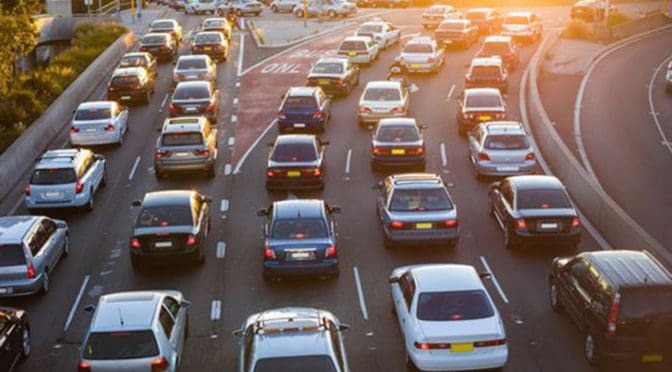 The New York area has the longest average commuting time — almost 35 minutes — of any metropolitan area, according to the Census Bureau in its analysis of the 2009 American Community Survey. But the other nine metro areas in the top 10 also averaged a half hour or more. And even the area with the shortest average commute, Great Falls, Mont., still clocked in at 14 minutes. 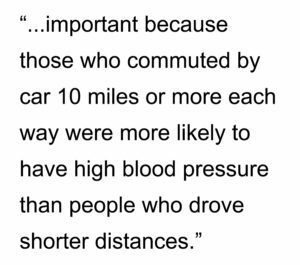 That’s important because those who commuted by car 10 miles or more each way were more likely to have high blood pressure than people who drove shorter distances. And those who traveled 15 or more miles each way were more likely to have bigger waistlines and less likely to be physically active, according to Hoehner’s study. Tom Ricci, 53, drives 130 miles round trip each day from his home in Mahopac, N.Y., to his job at a music record company in Lyndhurst, N.J. He gets up at 4:30 a.m. almost every day to hit the gym before work. Diet, exercise and sleep habits were not looked at in the study, Hoehner said. They also can also contribute to obesity and high blood pressure. Christine Bruno of Garrison, N.Y., feels the difference. Her commute used to be 7 minutes. Now since she moved in with her fiance it take up to 90 minutes each way to make the 40-mile trek to New Rochelle, N.Y.
Danielle Mahoney, 36, lives in Patterson, N.Y., works in Suffern, N.Y., and commutes 126 miles round trip a day. Her company offers fitness classes to employees several times a week so they can exercise during the day. Without them, Mahoney said, she wouldn’t have time for the gym, especially with twin toddlers at home. Dr. Franklin Zimmerman, a cardiologist and director of critical care at Phelps Memorial Hospital in Sleepy Hollow, N.Y., said what makes long commutes by car even worse is that many people are also sitting at work. He tells patients to get 30 minutes of moderate to vigorous exercise each day. If people can’t get to the gym, he suggests they park their cars farther from their offices and then walk. People can also sneak in exercise by getting off the elevator and taking the stairs. via Long commute time linked with poor health, new study shows – USATODAY.com.